Cleaning & disinfecting keyboards & mice is a necessary protocol. Allowing your staff to depend on “self-cleaning keyboards & mice” is asking for trouble. Antimicrobials do not tackle 3 dimensional bio-burden buildups. Wiping away the offending matter with a proper disinfectant wipe, or terminally cleaning in a 1:10 bleach solution, is the proper protocol. Many antimicrobial additives require humid conditions, like a sauna, which is more humidity than you’ll ever find in a hospital. It can take 24+ hours for antimicrobial additives to work. The additives don’t work fast enough between patients. The efficacy of all antimicrobial additives is under review by the EPA. Why subject your medical staff and patients to unnecessary exposure? 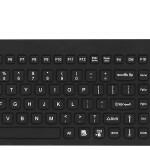 Does this ‘antimicrobial keyboard’ really work? Judge for yourself. 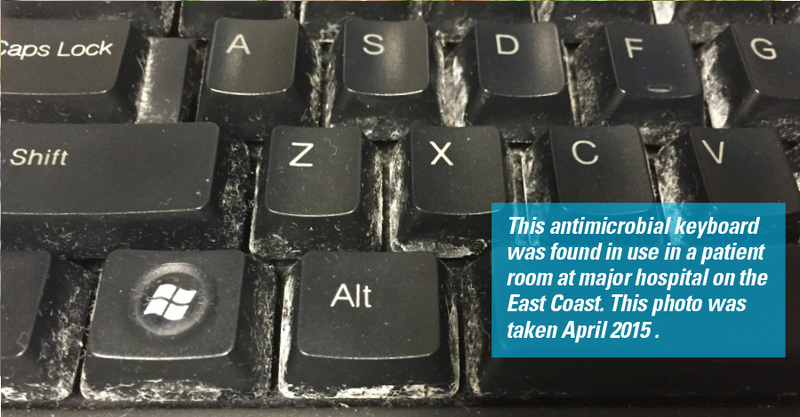 Bioburden buildup & open style design makes this antimicrobal keyboard a patient & staff hazard!